Are you a violist? Show the world your momma didn’t raise no dummy with this sassy Paid More Per Note design! 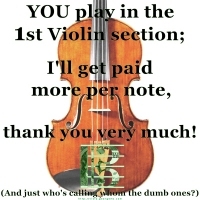 “YOU play in the 1st Violin section; I’ll get paid more per note, thank you very much! (and just who’s calling whom the dumb ones? )” Any one who plays the viola in an orchestra can relate to this sentiment, whether they share it or not! Purchase this design now, exclusively from Bratsche’s Viola Bazaar, on various apparel and giftware items including t-shirts, hoodies, bags and mugs.